Following news that the Lisbon Treaty will now be ratified by all member states, David Cameron pledged his future to making further pledges but said that the days of a cast-iron pledge may now be unsustainable. Mr Cameron said that the Tory leadership would lead the way in promising things and then not following through with them. Pointing at New Labour, and Gordon Brown in particular, Mr Cameron said he would improve the government’s record on pledges. 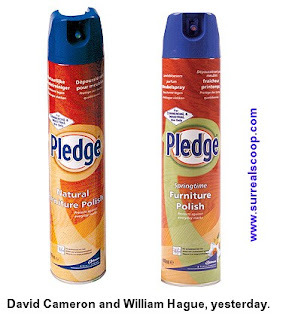 Mr Cameron gave a further copper-bottomed guarantee that his policy would also include, “concrete pledges” , “hard-and-fast promises”, and “indications of the direction towards which future intent might gravitate”, having already begun with his promise to "work a day in his life". The Conservative leadership is keen to stress that it is completely united in its desire to gain power and avoid any unseemly debate over closer European integration which following through on an actual promise may well entail. However Mr Cameron re-iterated that the traditional conservative cast-iron promise industry was now unsuitable for a modern, globalised political environment.